When ArchivesACT began in 2008, we had inherited the 7" single pictured above and were curious as to its origin as no one knew anything about it. 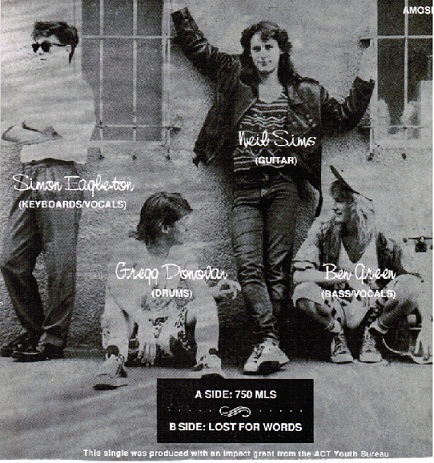 As can be seen it's cover has little information - '750 mls' and 'Lost for Words' in the upper left corner, 'Treble up 2, Bass down 2' and the product number 'AMOSP 9001' on the record label. After listening to the record it was clear that '750 mls' and 'Lost for Words' were the song titles. We guessed that the band might be called 'Treble up 2, Bass down 2' but this could also be related to the recording mix. After unsuccessfully performing general searches of the song titles on the internet we proceeded to search archival institutions such as the National Archives of Australia and the National Library of Australia. We finally had success with the National Film & Sound Archive who had two catalogue records for this single. The more complete of the two catalogue records here has a matching product number and listed the band name as "Caught Red Handed by Screemin Meemz" (also known as just Screemin Meemz). The catalogue record also states that the recording was made with an IMPACT Grant from the ACT Youth Bureau. Armed with this information we then found mention of the IMPACT (Improve the ACT) program in the Commonwealth Senate Hansard 19/08/1986 and the ACT Legislative Assembly Hansard 16/02/1993 ( PDF 343Kb). From the late 80s/early 90s style of the music we thought that the earlier of the two files might relate to the songs. Unfortunately both of these files could not be located. The band formed in 1987 & we broke up in 1991. 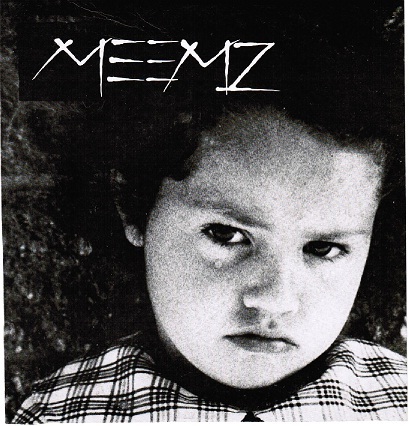 We were originally called 'The Screamin' Meemz' until we found out about a band in New Zealand called 'The Sreaming Meemies' so, in late 87' we changed our name to 'The Meemz'. Ben Green - Lead vocals / Bass Guitar. Simon Eagleton - Keyboards / backing vocals. Ben, Neil & Simon we all friends in year 11 at Copland College. I was in the same year at Hawker College. We met early in 87' at a house party in Aranda & started rehearsing the following weekend. My father was the Principle at Hawker College at the time so, we always rehearsed there on weekends. Our first live show was at the Belconnen Youth Centre. Over the coming two years we used internal promotion in all Canberra public colleges & street posters to build a fan base. We mainly performed at Belconnen & Civic youth centres & occasionally the Woden youth centre. We were very proactive with our promotion & normally sold out our shows with crowds of around 300 - 350. We did one international support playing as the opening act for Joe Satriani at Llewellyn Hall in Canberra. Once we all turned 18 in 88' we started playing lots of pub shows in Canberra, up at the snow & all down the south Coast. We supported Aussie acts like The Party Boys, Wa Wa Nee & The Allnighters. I co-managed the band with a guy called David Morphett. David was the production co-ordinator for the Canberra Youth Theatre & I met him there as I was enrolled in acting classes. It was his idea to get the Impact grant as he had heard about them through the Canberra Youth Theatre. Attached is the front & back covers for the single you have. The one you have with the yellow sleeve is one of only four copies that were done as test pressings. We printed 1000 copies of the single with artwork & sold them at shows & at the Impact Record store in Civic.